International Aviation Support has been appointed by Genesys Aerosystems, also known as S-TEC Corporation, as official sales and service center. Since its founding in 1978, S-TEC Corporation has shipped over 40,000 autopilot systems. 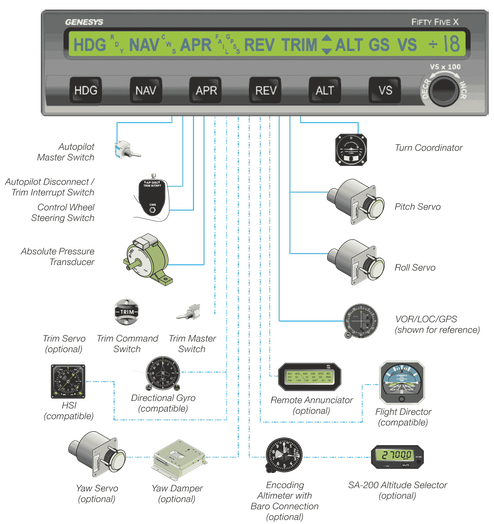 S-TEC offers one of the most comprehensive portfolios of autopilots for airplanes and helicopters. From low-cost analog wing levelers to sophisticated, digital, three-axis systems with Flight Director and envelope protection, S-TEC has over 1,500 FAA and international certifications for more than 1,000 aircraft types. Over the years International Aviation Support has acquired a vast experience with Genesys autopilot systems. With the appointment as dealer and service center, we can offer high quality maintenance services and also complete retrofits and modifications. The Genesys autopilot system can be fully integrated in the existing avionics suites. Feel free to contact us to discuss the possibilities for your aircraft.